Grab a compact label that makes your voltages clear and easy to see. 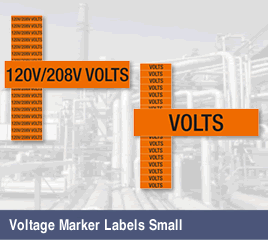 These bright orange voltage marker labels fit in small spaces to clearly mark your electrical areas and equipment. • Bold orange labels stand out in any environment. • A glossy, durable finish withstands normal wear and tear.